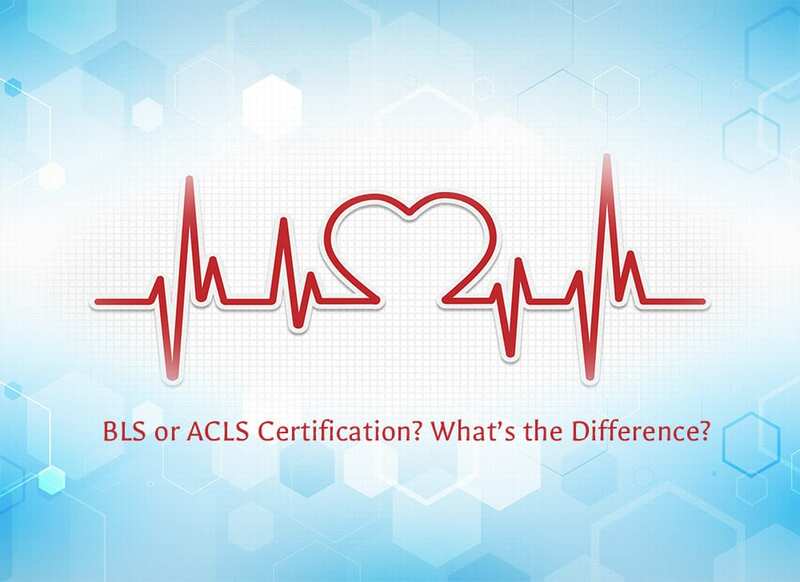 Home/What’s the Difference Between ACLS and BLS Certification? When it comes to the amount of healthcare certifications available, it can sometimes be confusing to figure out which you need and for what. BLS certification and ACLS certification programs are an excellent example, as both focus on having the proper techniques to saves lives in the event of cardiac arrest. But are they really the same? The short answer is no; they differ quite a bit – specifically in the level of advancement. So, what is the difference between BLS and ACLS, and which do you need? Read on to find out. What does BLS training teach you? BLS stands for Basic Life Support, and it is what it sounds like. BLS training provides you with the basic first steps to getting a patient stabilized. Your goal, as a BLS responder, is making sure the patient stays stable until a first responder can reach them, or until they can be taken to a hospital. Basic Life Support certification is intended to teach people basics such as CPR and AED (automated external defibrillator) usage. It also teaches skills such as how to stop safely stop a child or an adult from choking. Most BLS certification courses last less than 5 hours and include various ways of teaching to meet a variety of learning methods. They include hands-on training using simulations and learning stations, as well as class-room based work. The American Heart Association BLS certification through Project Heartbeat is valid for two years. Who can use BLS training and certification? Since BLS is usually performed outside of a hospital, you don’t have to be a medical professional to get BLS certification. Although most healthcare providers are required to take this course, it’s open to the general public. If you work with people on a daily basis, it can be very useful to have. In fact, many coaches, lifeguards, childcare providers and teachers have their BLS certification. What does ACLS training teach you? ACLS stands for Advance Cardiac Life Support and, again, it is what it sounds like. ACLS training gives you advanced techniques for stabilizing a patient. However, while it’s built on BLS (in fact, our ACLS certification course includes BLS training), it goes far beyond stabilization, and moves to actual life support. For example, the course will teach you how to properly use a defibrillator, but also includes learning how to read and understand ECGs, and emergency-scenario algorithms to follow. You’ll learn about medications – which ones to use, how much, and when -, and how to properly administer them (oral or intravenous, for example). Other tools you’ll learn is how to use intubation materials, how to use glucose machines and cardiac monitors. ACLS certification classes typically last for two long days, due to the amount of material covered. As with BLS certification, it includes several methods of learning, from class-room and text-book based learning to hands-on training. The American Heart Association ACLS certification through Project Heartbeat is valid for two years and provides 12 Continuing Education credits. Who can use ACLS training and certification? As you can see, ACLS takes quite a bit of clinical training, most of which is unable to be performed outside of a hospital or clinic situation. Because of this, as well as the pharmaceutical aspect and type of tools used (cardiac monitor, for example), ACLS certification is specifically for healthcare professionals. Which is certification is right for you? Some employers will require BLS training or both BLS and ACLS. However, most will indicate what level of training is needed. If you’re a medical professional, you’re required to take BLS certification. As mentioned above, it’s also a helpful certification for childcare providers, teachers, coaches and those who deal with people on a regular basis, although not necessarily in a health situation. If you are a healthcare professional who will be dealing with serious emergencies, ACLS certification is essential to be a better healthcare provider. Project Heartbeat provides both BLS and ACLS certification courses to meet your level of need. Sign up for our Oakland or Sacramento Campus to get started or, if you have a group of eight or more, we’ll come to you for training. Join us in saving lives through education!